An incision is a cut made into the tissues of the body to expose the underlying tissue, bone or organ so that a surgical procedure can be performed. An incision is typically made with a sharp instrument, such as a scalpel, that is extremely sharp and leaves the skin and tissues with clean edges that are able to heal well. Incisions can also be made with an electrocautery tool, which uses heat to both cut and cauterize at the same time, which can dramatically minimize bleeding during a procedure. It is a common misunderstanding that an incision cuts through just the skin when in fact it typically goes through the skin, fat, the underlying tissue, and often through muscle in order to allow the surgeon to access the surgical site. Incisions can also expose bone, which may also be cut, depending upon the nature of the procedure. Like an iceberg, an incision is much deeper than it appears on the surface. This is why an incision may appear to have healed on the surface in only a week or two but can take months to reach full strength as the underlying muscle and tissues continue to heal. It is also why your surgeon may give you restrictions to not lift anything heavy that last well beyond when the wound appears healed. A traditional "open" incision is a large incision used to perform surgery. An open incision is typically at least three inches long but may be much larger, varying from surgery to surgery and the severity of the problem. This allows the surgeon enough room to work and see the area that is being worked on and to insert the necessary surgical instruments to perform surgery. 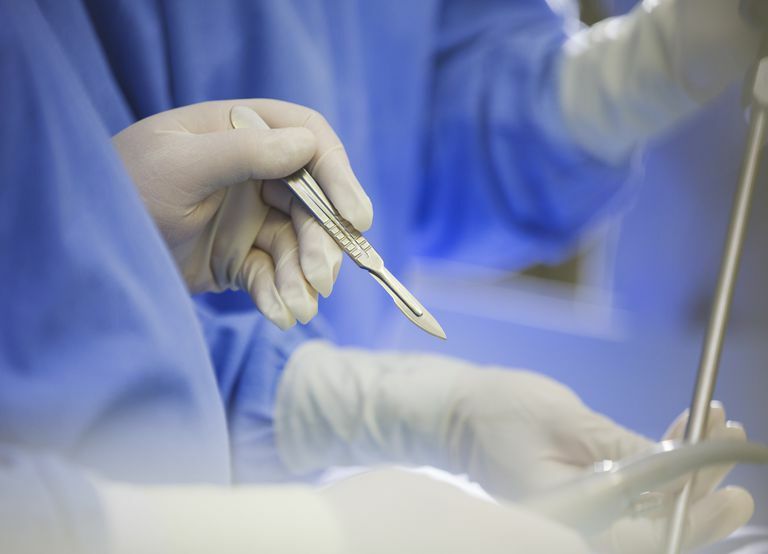 An incision may be enlarged during surgery in order to give the surgeon more room to work. For example, when a patient is having gallbladder surgery, a small incision may initially be made. If the surgeon discovers that the gallbladder is very large and full of gallstones, the incision may be made larger so that it is large enough for the gallbladder to be removed. Surgical incisions, in general, are getting much smaller. Laparoscopic, or minimally invasive (keyhole) incisions, are much smaller than the traditional open incision and are just large enough allow surgical instruments to be inserted into the body. Instead of having one incision that is four inches long, you may have three or four that are less than an inch long. For abdominal surgeries, one of these is often hidden in the belly button, so scarring is minimized. It may seem odd that multiple incisions are better than one, but it is harder for the body to heal one large incision than multiple small incisions. Incisions require tender loving care, not harsh scrubbing and strength testing. Be gentle on your incision, don't push your incision to its limits as they can and do open when too much stress is applied. Don't scrub your incision, scabs on will form on your sutures and they are supposed to be there, it is a sign of healing. Use gentle soap and water in the shower and rinse thoroughly. If you were given dressing change instructions, be sure to follow them. If you notice your incision starting to open more than one or two sutures, let your surgeon know, as it should be healing along the entire incision, not just in random places. A gap in your incision is an easy way for infection to begin as it allows an easy access point for bacteria. Your incision should heal, sometimes slowly, but still with steady progress from red and sore to pink and healthy new tissue filling in the wound. Diabetic patients will often heal more slowly, as will patients who are have chronic illness or were very sick at the time of surgery. Incisions have changed dramatically over the last few decades, leading to faster healing and quicker recovery times. An appendectomy, for example, has changed from a 3-4 inch incision to multiple small incisions about a centimeter long. Long story short, don't assume your incision will look like the one your friend or family member has, the surgery may have changed dramatically since their procedure. Abdominal incisions in general surgery: a review.